SoHo was full of artists. Not any longer: They can’t afford the rents. Artists move into an affordable neighborhood, some say “discover” it, give it its cachet making it fashionable and then are chased out again as rents rise. The Sisyphean sequence is increasingly common and recognizably played out repeatedly on an accelerating basis as rapid gentrification is more and more the norm. . .
. . . Tuck that thought away away for a moment or you won’t completely appreciate just how insidious is the story you are about to hear about the privatization of public space with a “politically connected nonprofit” from the Bloomberg era angling for insider no-bid deals. What does all this have to do with the sale and shrinkage of New York City libraries? We’ll be getting to that. One hint, though, before I invite you to walk with me through a detective story: How many people do you think know that before leaving office the Bloomberg administration created a private company to use public money to privatize public space? . .
. . Like many a good detective story we are about to poke and peer with interest at a lot of things that may be other than they appear to be. Another hand-off? : On December 18th the Bloomberg administration was pushing through another privatizing hand-off to cronies that got the attention of the Daily News. This time it involved part of Brooklyn Bridge Park. The deal was ultimately delayed when it came under scrutiny by the New York City Comptroller’s office. See: Parks advocates slam the Brooklyn Bridge Park Corp. for giving free space to Spaceworks NYC- The park's board voted late last year to give the arts organization a 15-year no-bid cost-free license agreement to occupy two floors at the 334 Furman St. office building inside the park. by Reuven Blau, Monday, February 3, 2014. 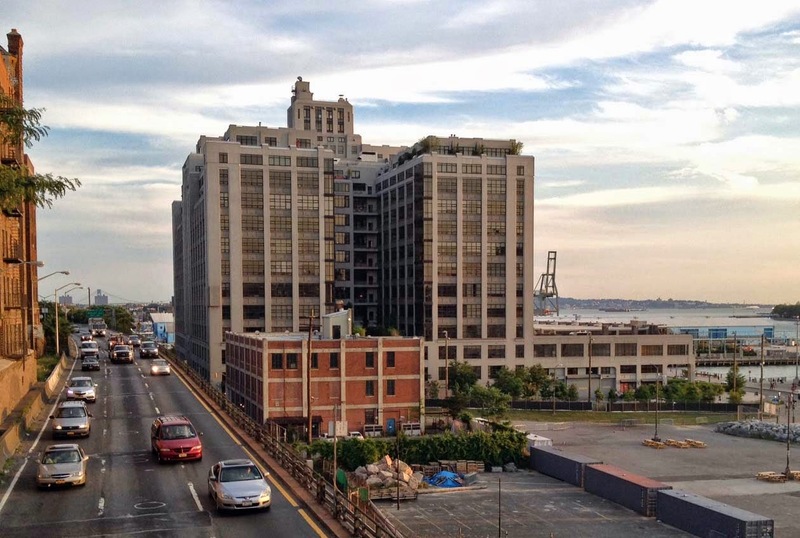 Parks advocates are slamming the Brooklyn Bridge Park Corp. for giving a politically connected nonprofit a free ride in an old dock building that could have generated big bucks. The park's board voted late last year to give Spaceworks NYC, an arts organization, a 15-year no-bid cost-free license agreement to occupy two floors at the 334 Furman St. office building inside the park. Critics of the Dec. 18 vote contend that other charity groups should have been allowed to bid for the space and lament that the arrangement got no public input or scrutiny. "This is public land. There is absolutely no justifiable defense for trying to get away with this," said Geoffrey Croft, president of New York City Park Advocates, a watchdog group.
. . . President Regina Meyer later wrote that the park's policy did not require the board to follow that [bypassed request for proposals] process. "These sleazy, behind closed-door-deals that flowed freely under Bloomberg must be extinguished," Croft charged. Other Spaceworks Porjects- Also No-Bid? The Daily News focused specifically on this no-bid handout to Spaceworks that was spotted by the vigilant community watchdogs keeping track of Brooklyn Bridge Park shenanigans, but there were also other similar hand-offs to Spaceworks simultaneously in the works. More important, Spaceworks was also taking over and converting to different use substantial space at two Brooklyn Libraries, essentially a privatizing sell-off, one in Williamsburg and the other in Red Hook. Guess what? : The Brooklyn Bridge Park board, faulted for its lack of judgement by the Daily news when it approved the no-bid contract giving the Brooklyn Bridge Park to Spaceworks notably has overlapping members, now increasingly so, with the trustees of the Brooklyn Public Library. See: New Scrutiny of City's Library Trustees- The trustees of the city's library systems oversee more than 200 branches and the spending of hundreds of millions of city dollars. How representative of the city are they? By Suzanne Travers, June 18, 2014. Those of the trustees who overlap are prone to push development agenda. The way that such individuals pushing for development get shuffled and reused is pretty common so overlap was also a complained of problem in the Daily News article about the Brooklyn Bridge Corporation’s vote: Robert Steel, former Deputy Mayor for Economic Development under the Bloomberg administration, was criticized for conflict of interest being on both the board of Spaceworks and the Brooklyn Bridge Park Corporation notwithstanding that he recused himself from the criticized December 18th vote. Steel worked at Goldman Sachs, Barclays Bank, Wachovia/Wells Fargo with the majority of his career, nearly thirty years, spent at Goldman. Alicia Glen is now on the Speaceworks board, ex officio by virtue of her appointment by Mayor de Blasio to the position of NYC Deputy Mayor for Economic Development. She also worked at Goldman, moving from the firm into that position. The trustees of the Brooklyn Public Library currently reflect the fact they were mostly appointed by Bloomberg or those under his influence: either former Brooklyn Borough President Marty Markowitz or by the trustees that each of these two men respectively appointed. When Spaceworks materialized as the beneficiary of the December 18th vote, the reaction of the community watchdogs was apparently: `who the hell is Spaceworks and why should they be the proposed beneficiary of such largess.' Who they are is a good, not easy to answer question. The Daily News article refers to the group as “hatched by the Bloomberg administration in 2011.” “Hatched” is a good word because of the way that Bloomberg administration was funneling not only assets, but city money their way. If the Brooklyn Bridge Park space is given to Spaceworks the private company would also have been spending a reported $6 million the Bloomberg administration was giving it to renovate the space. The current NYC budget figure is now $6.2 million. $6.2 million for Brooklyn Bridge Park plus at least $4.5 million for the Spaceworks Governors Island premises (and they have other projects as well): pretty soon it adds up. Pretty soon it thoroughly dwarfs even the intentionally inflated amount that the Brooklyn Public Library and Bloomberg administration officials were saying can’t be spent to repair the air conditioning in the Brooklyn Heights Library, a central destination library that is at least the second most important in the BPL system. The intertwining arrangements - which move money between multiple city-funded entities - can be difficult to follow, even for experienced government watchdogs. When I was in government having to give legal opinions about what government development and finance officials could do within the parameter of their jurisdiction in running programs, the question came up more than once whether government officials could go beyond the powers they had been formally granted by the legislature and the often specific prescriptions of program legislation and, by acting in a simultaneous private citizen capacity, amplify their powers. It might even be proposed that they could essentially partner with themselves, their official government functions collaborating with their personally assumed roles. I will leave you hanging as to what the answer to these questions actually was. I will instead ask you another question: Do you really think that would be a good idea no matter what the answer was? One thing you see when you look at the structures that the Empire State Development Corporation (actually the “Urban Development Corporation” if you go by its statutory given name) has created with subsidiaries for the governance of Brooklyn Bridge Park, Governors Island or the Financing of Atlantic Yards is that those statutorily permitted subsidiary structures can be unexpectedly complex and confusing and not necessarily in the public’s best interest. However, Spaceworks was created it was not created by ESDC and is not an example of what is permitted. Nor is it a subsidiary of anything. Spaceworks NYC, Inc. is filed as a domestic not-for-profit corporation with the New York Department of State. Maybe the Bloomberg administration thought about hatching it in 2011 as the Daily News reports but its initial corporate filing with that office was closer to Bloomberg’s departure from office, June 28, 2012. Its filing was handled by Forsyth Advisors (588 Broadway). Positioned at the intersection of real estate and public finance, Forsyth Street Advisors excels at structuring and executing innovative financing solutions for real estate projects. Forsyth has an unsurpassed reputation for deploying public and private resources to capitalize large-scale residential, commercial and institutional projects both in New York City and nationwide. There is virtually nothing on Spaceworks’ website that explains its mission, but you can see a concentration of real estate development associated names on its board. There is also no mission statement filed with the IRS. To discern its mission we must instead look at what it is doing and a description of its projects and listen, with a grain of salt, to how those are being described. From Spaceworks PowerPoint presentation: Utilize "public . 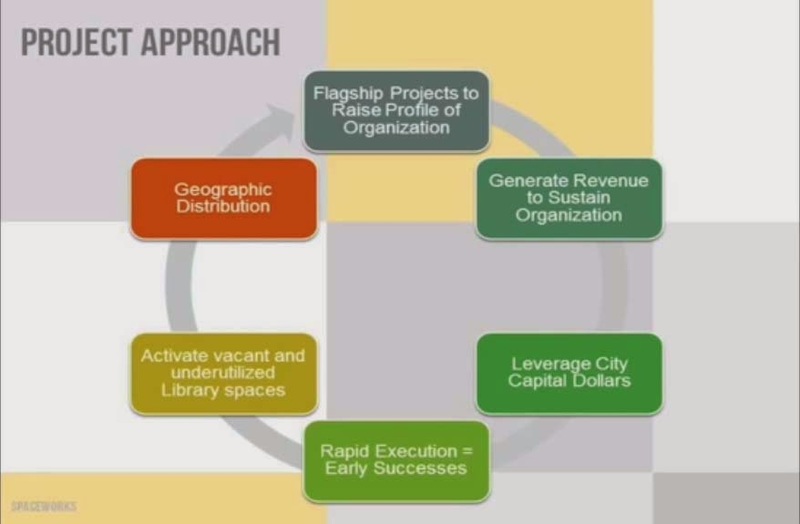 .real estate assets"and "initially focusing on surplus city-owned property"- Like the libraries? A feasibility study funded by the Charles H. Revson Foundation and conducted by Forsyth Street Advisors in 2011 led to the creation of Spaceworks as an independent nonprofit that would transform underutilized public and private facilities into workspaces for cultural use. 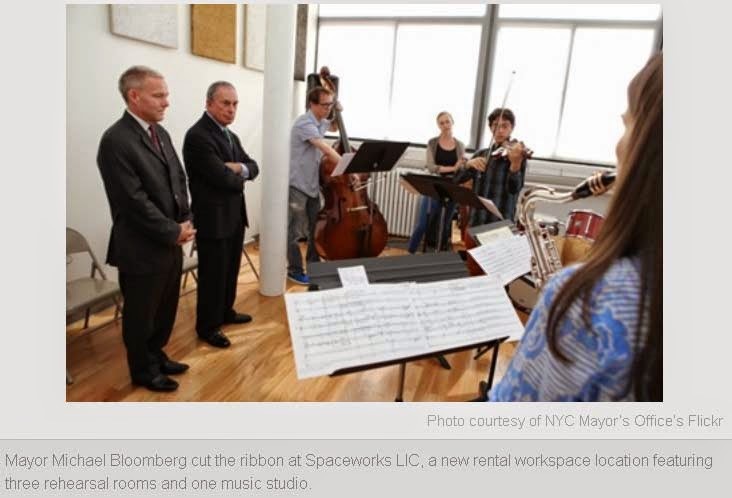 See: Mayor Bloomberg Opens Affordable, Rentable Work Space For Artists In Long Island City, August 20, 2013. 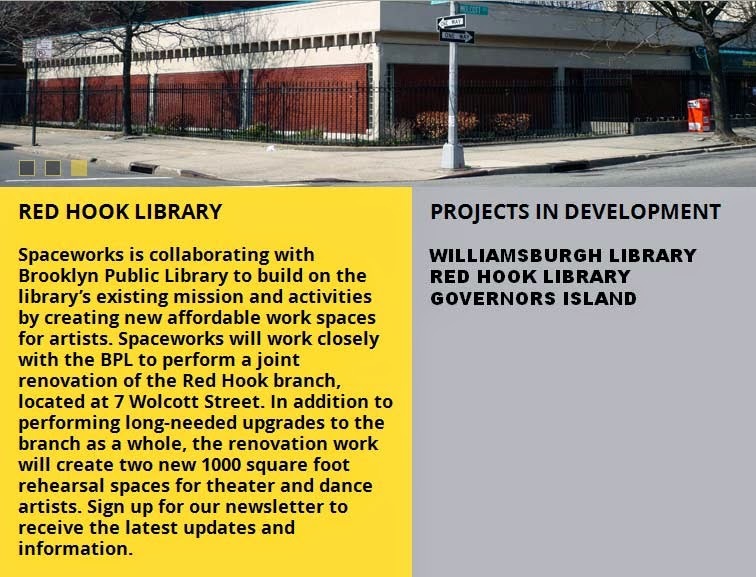 That same Office of the Mayor release listed as two of its three upcoming projects Spaceworks taking over library space at two Brooklyn libraries, the Williamsburg branch and the Red Hook branch. 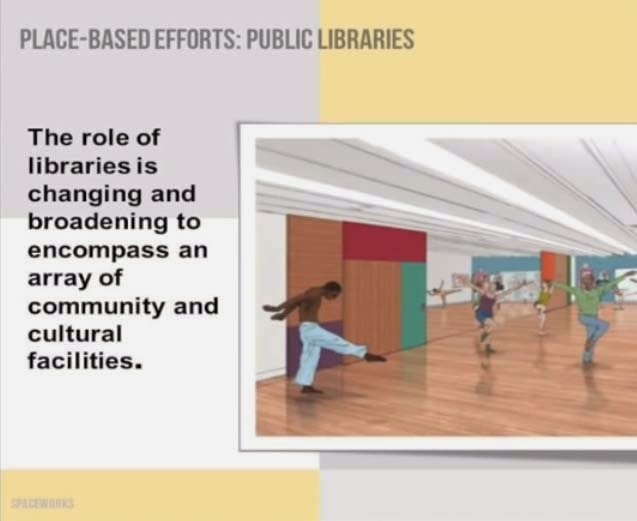 Is that library space therefore presumably “underutilized public” space? Even though another Revson Foundation funded study, “Branches of Opportunity,” by the Center For and Urban Future, says that New York City library use is way up, 40% programmatically and 59% in terms of circulation? The same mayoral release identifies as amongst the “current program partners” for “collaborative projects,” The Brooklyn Public Library. Does that mean that Spaceworks and the BPL view much of the BPL space as underutilized and subject to being taken over? Taking over the public space for private use is the perfect way to provide much-needed cheap digs to creative types, an organizer said. (See: Libraries invite artists and musicians to move in upstairs, By Danielle Furfaro, February 27, 2014.) In Brooklyn the libraries are city owned public spaces. The Brooklyn Paper article came out shortly after the Daily News article about the absence of a competitive bid (and public scrutiny) respecting the Brooklyn Bridge Park property. Do we think that this takeover of “public space for private use” at the Brooklyn Public Library with all its Bloomberg appointees, or at the Bloomberg-controlled Governors Island involved competitive bid or an appropriate level of public scrutiny? That seems highly doubtful indeed. 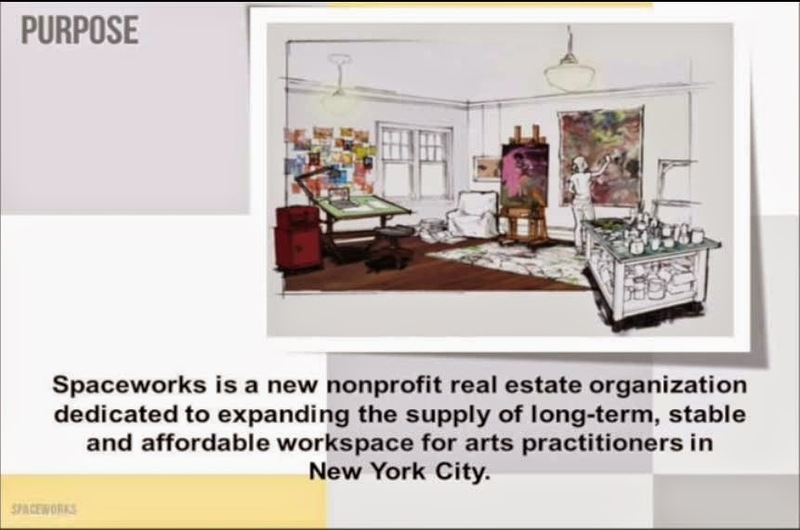 ARTPLACE: What types of public and privately-owned spaces will Spaceworks repurpose? How many spaces are you looking to develop, thus far? PARKHILL: We're being opportunistic and looking at literally dozens of sites right now. We're generally exploring buildings and spaces that are vacant, although there are a couple of sites that I'd characterize as underutilized. 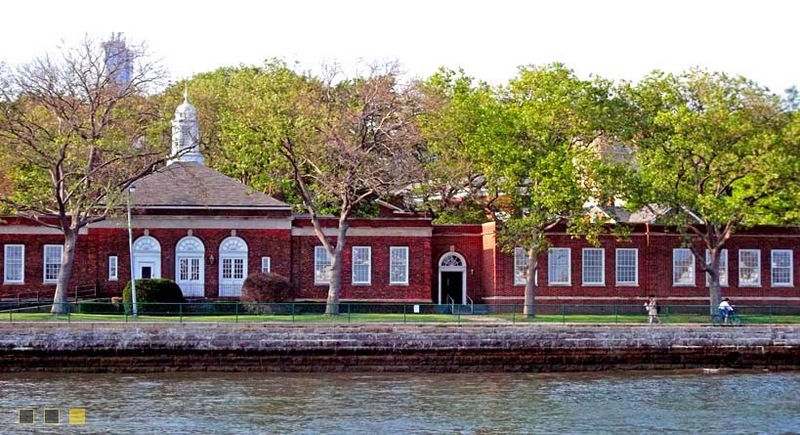 The prospects are pretty incredible: old schools on Governors Island; abandoned caretaker apartments in public libraries; century-old institutional buildings that have been largely vacant for decades, and more. (See: Spaceworks, by ArtPlace America New York, NY, June 18, 2012.) NOTE: It should not go unobserved that ArtPlace is described as one of the key early funders of Spaceworks, so that what poses as its journalism here should not be considered the most objective. Don't be alarmed: The city-owned assets that Spaceworks is going after (like libraries as a first focus) are "surplus." So it is no problem when Spaceworks `thinks strategically' about them working collaboratively with "private partners"
The Goal of Spaceworks to Hold Space "Long-term"
The Spaceworks promise? "Long-term" space to make life more "stable" for artists? Possibly Needing the Space for "Different Purpose"? 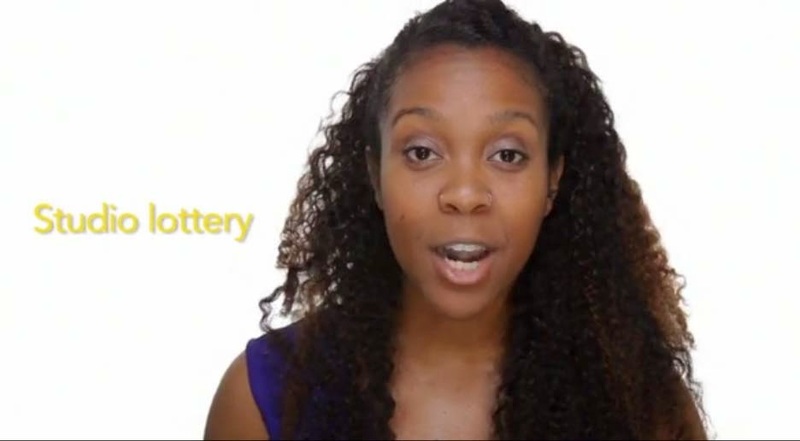 The space is handed out to artists via “a lottery.” That’s reminiscent of the city’s housing programs where only a few from the entire community can benefit in the end, programs that have often been used by development officials, as in the case of Atlantic Yards and other controversial projects, as wedges that divide communities against themselves. The “lottery” reflects the introduction by Spaceworks in is role as “real estate intermediary” as the Village Voice phrased it, of something that didn’t exist in the function of market mechanisms when artists took over underutilized spaces in cycles of gentrification: Scarcity. A World Tamed For Artists or Just Some Tamer Artists? The most famous story of artists occupying underutilized properties to transform a neighborhood and imbue it with new vitality is New York’s SoHo. Those artists were an adventurous crew, ignoring, later changing, building and zoning codes, living were it wasn’t officially residential and often without conventional amenities, even sometimes heat and hot water. They not only transformed the neighborhood they took over, they actually rescued it more ways than one. There was a reason that the manufacturing space in SoHo was underutilized and one more reason those artists may be considered adventurous: The neighborhood lived for years under threat of condemnation because Robert Moses planned to build the ten-lane Lower Manhattan Expressway that would have wiped out much of the neighborhood and Little Italy as it connected the Holland Tunnel to both the Williamsburg and Manhattan Bridges. Activists, including Jane Jacobs, fought the plan that had been pursued for two decades and won. Activists like Margot Gayle were also responsible for preservation of much of the neighborhood’s architecture with the establishment of the SoHo-Cast Iron Historic District. SoHo is now more a shopping district with very high-priced residential real estate. While some artists have carried over and still live there and a few galleries remain, and while the artists may be outnumbered by Wall Street bankers, many artists benefitted as the neighborhood changed. Some even made killings in the real estate market when they sold. 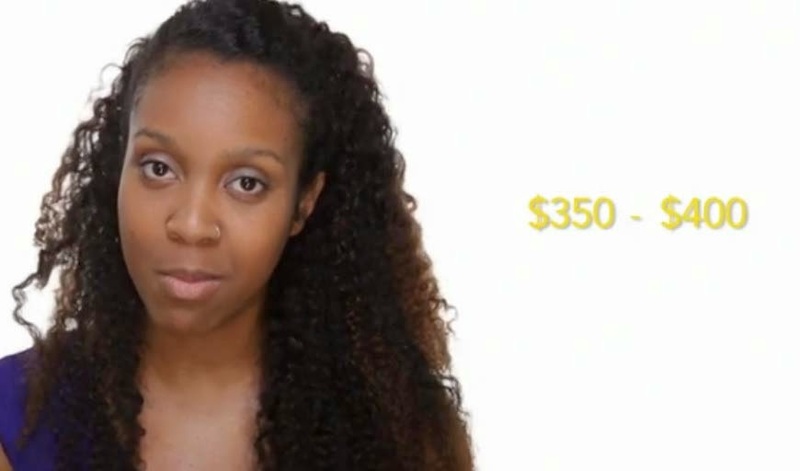 The idea with Spaceworks is that artists don't have to make expensive and risky real estate investments, but instead can affordably find spaces that fit their unique needs. (It's sorta like these incubator projects that Bloomberg keeps talking about). 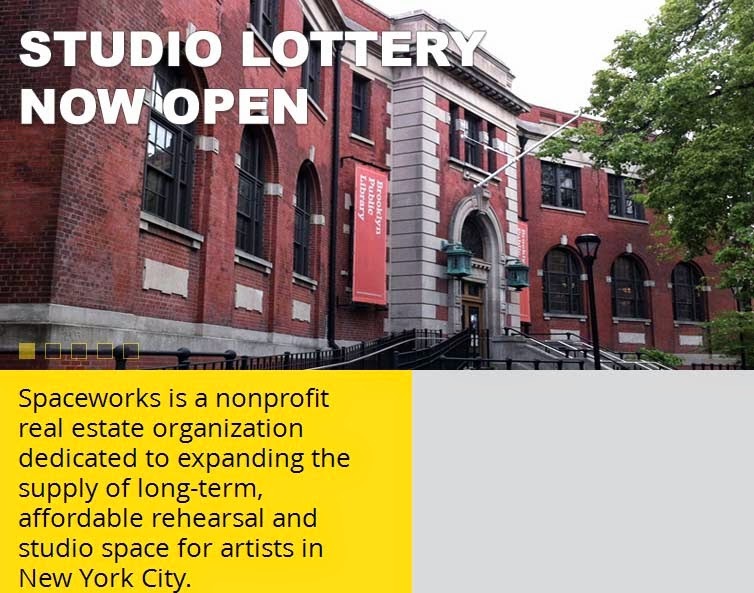 Spaceworks might do broad outreach to artistic communities with the prospective promise of benefits, it might have charrettes that whet artists' appetites asking what their dreams might be, but in the end dribble out just a few subsidized studios to the lucky lottery winners. Will they be duly appreciative that Spaceworks largess comes from core funders “ArtPlace, the Revson Foundation, the New York Community Trust, The David Rockefeller Foundation, Deutsche Bank, and the [Bloomberg] New York City Department of Cultural Affairs.” Will they be able to sort out that most of that largess comes from the last-named Cultural Affairs Department? Although Spaceworks is adding additional projects to its list, when its first five projects were unveiled, the Wall Street Journal (Aug 20, 2013) reported those projects would cost a total of $5.8 million, of which the city would be paying $5.3 million. That was four months prior to and didn’t include the vote on the $6 million Brooklyn Bridge Park Spaceworks project. However the funds were actually shuffled around, the inaugural Spaceworks project, Spaceworks LIC, 3,800-square-feet, located at 33-02 Skillman Avenue in Long Island City, which got lots of focus with the mayoral release promoting Spaceworks wasn’t theoretically financed by Cultural Affairs. The mayoral release got to state that its relatively low $200,000 price tag was privately funded. City funds for Spaceworks projects are on the rise although new specific projects don't yet seem to be identified. The city’s Independent Budget Office tells me that it has been able to find $15.15 million thus far committed for Spaceworks-related projects through 2018. Collecting these funds, Spaceworks, charging for its spaces, intends ultimately to become "self-sufficient." According to the real estate site, The Real Deal, Spaceworks is renting some of its spaces for "50 to 60 percent of the market rate." See Artists turn to temporary workspaces in tight market- Shared spaces operated by nonprofits offer rents at roughly half the market rate, May 30, 2014. Notably, the activism to preserve SoHo worked against what the mega-planners like Moses intended for the city. In a PowerPoint presentation describing its activities Spaceworks puts the various logos of the city planning agency, the city’s real estate development corporation (EDC) and the buildings department, up amongst those it considers its partners. Yes, the world has changed: That's same Department of Buildings whose edicts were defied by the artists who settled SoHo. PARKHILL: Most groups that create or manage space for artists do so as a secondary activity that grows out of their cultural mission, and can at times distract from it. Spaceworks represents the reverse: our mission is creating and managing space first and foremost. Since many of our projects involve the use of public funds and public buildings with multiple public and private partners, these are pretty complicated and varied real estate transactions without obvious precedents. Spaceworks was created to bring real estate development, planning, management and operations expertise to the field to address the workspace needs of artists. (See Spaceworks, By ArtPlace America New York, NY, October 11, 2012. 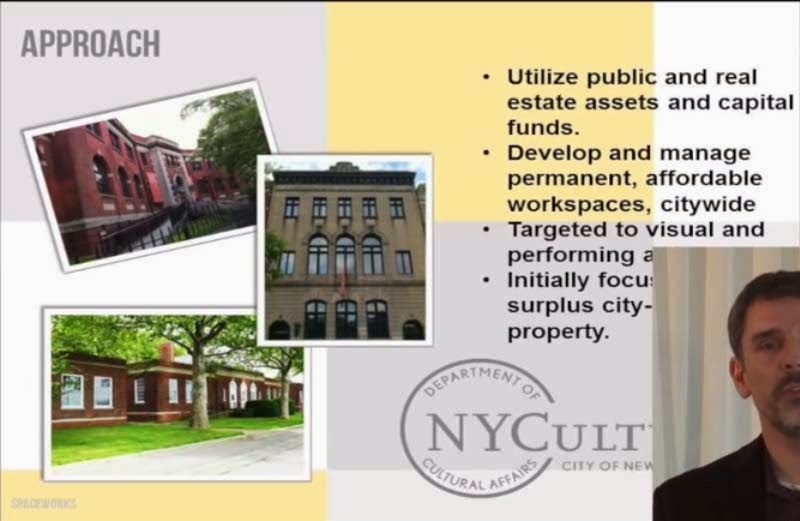 Parkhill also frequently describes Spaceworks as pursuing an economic development function although funded out of the Department of Cultural Affairs and, as we will soon be discussing in more detail, redeveloping and converting library resources. Urbanist Jane Jacobs in her “Death and Life of Great American Cities” (1961) in a discussion about the constant shifts and changes of uses in the urban environment gets into a discussion (starting at pages 168-169) about how cultural institutions can be viewed in the words of land-use economist Larry Smith as “chess pieces” that, susceptible to public influence, can be deployed in weaving the fabric of the city and maintaining its vitality. Jacobs was talking about major institutions like Carnegie Hall or those multiple institutions that Jacobs thinks were improperly segregated and consolidated into the “planning island” of Lincoln Center. Spaceworks is not dealing with grand institutions like Carnegie Hall. Nevertheless, I suspect that the real estate professionals pulling the strings at Spaceworks view the more interstitial Spaceworks projects largely like chess pieces too. When it comes to dealing with collections of individuals (in contradistinction to the major cultural institutions just mentioned), Jacobs always favored organic development rather than top-down, government-planners-know-best schemes and many free market economists would argue for the superiority of artists fanning out to tailor space for their own needs, perhaps creating new paradigms like loft living, rather than responding to a managed sweepstakes incentive to take one-size-fits all handouts of space. The stated primary purpose of Spaceworks may be to furnish artists with affordable spaces in which to work although ultimately the few actually served will be proportionateley minuscule. Figures Spceworks points to for reporters writing articles are that there are 124,000 New Yorkers identifying themselves as artists, writers or photographers according to the 2010 census. Will Spaceworks benefit more than a few score of them at best? Spaceworks may be said to be serving an “economic development function” when, by introducing artists, it brings greater vitality and stability to a neighborhood, seeking to somewhat replicate the benefit and course of events that unfold with greater naturalness when artists themselves act to take over less-utilized spaces. Will the vitality introduced be as great if the artists, rather than scrapping for space themselves, arrive there by applying and patiently waiting on the list to win a lottery? If the latter is true, then that would mean that the real mission of Spaceworks is almost the opposite of what is stated: it’s not to give artists long-term protection or a long-term role, it’s just to use them as interim fill-in on the way to a long term goal. It wouldn’t be the first time that soemthing was described as exactly its opposite to sell it to the public, like describing the shrinkage of libraries as being “an expansion.” See: Saturday, July 13, 2013, Deceptive Representations By New York Public Library On Its Central Library Plan: We're NOT Shrinking Library Space, We Are Making MORE Library Space! Taking this theory to be correct would mean that, in the instance of Brooklyn Bridge Park where Spaceworks is putting the bulk of its first real money, the most important goal of spending the $6.2 million proposed to be spent on the 334 Furman Street premises isn’t to lure artists within the boundaries of the park to ply their creativity in space over the offices of the Brooklyn Bridge Park Corporation. Instead the goal would be for the three story 334 Furman Street to one day be supplanted by a bigger building. The idea wouldn’t be to tear it down immediately, but one day during the Spaceworks’ 15 to 20 year control of the space, after change and public acclimatization to bigger buildings this could, without too much fuss or muss, be the site of a tall tower. It’s hardly far-fetched. 334 Furman Street is right next to One Brooklyn Bridge Park. 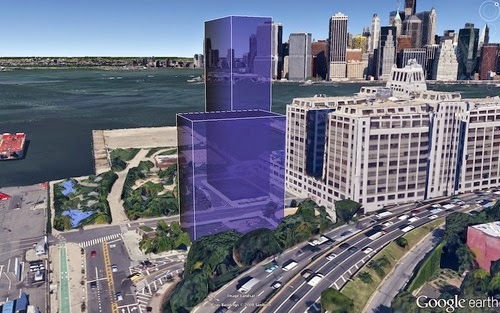 City and Brooklyn Bridge Park officials are currently proposing that two tall new towers will be built on the south side of One Brooklyn Bridge Park. (See: Brooklyn Bridge Park's Pier 6 Towers Could Take These Shapes, Curbed, by Jeremiah Budin, May 7, 2014.) 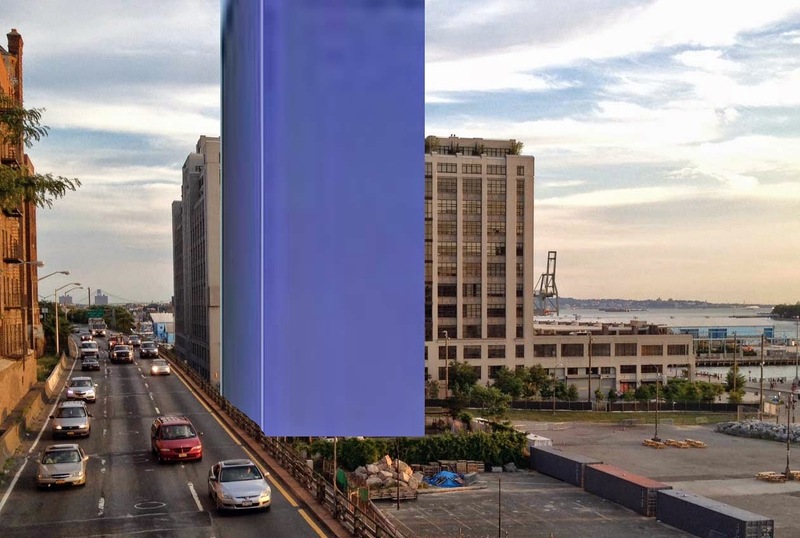 Across the street from those towers, on the other side of Atlantic Avenue, the real estate community is fighting hard to have Long Island College Hospital sold off for development with the expectation that there will be a continuous line of such tall towers overlooking the harbor. A fifty or sixty floor tower in place of 334 Furman Street would then be just one more tower in this long sequence of towers. Brooklyn Bridge Park is totally under the mayor’s control, so it would take only a mayor’s say-so to accomplish it. With the new, most recent plan to install "workforce housing" in the towers proposed for south of the One Brooklyn Bridge Park, Mayor de Blasio is already proposing to throw out the so-called “rules” that theoretically apply to Brooklyn Bridge Park. Further, since a new Furman Street tower would not have to pay real estate taxes to the city, whatever developer was given the project would be very grateful with all that could imply. Instead of taxes the developer would enter into a payment in lieu of taxes (PILOT) agreement, an arrangement developers are finding far more preferable given the way PILOTs are being done in the park (by some of those same board members and individuals supporting library sales). Maybe expertise about real estate development matters, including Mr. Parkhill’s own, is Spaceworks principal raison d'être, but Mr. Parkhill is also willing to expound on another subject important to the city’s future: The future of libraries. When he does so, he sounds just like those others (including City Councilman Brad Lander) that espouse the real estate industry’s view that it is time to sell and shrink the city’s libraries, getting rid of books and librarians. The 21st Century redefinition of and evolution of library space, which isn’t just about borrowing books anymore, but really its about kinda multifaceted community facilities. Councilman Lander also refers to “21st Century libraries” when he explains why libraries should be sold and shrunk. 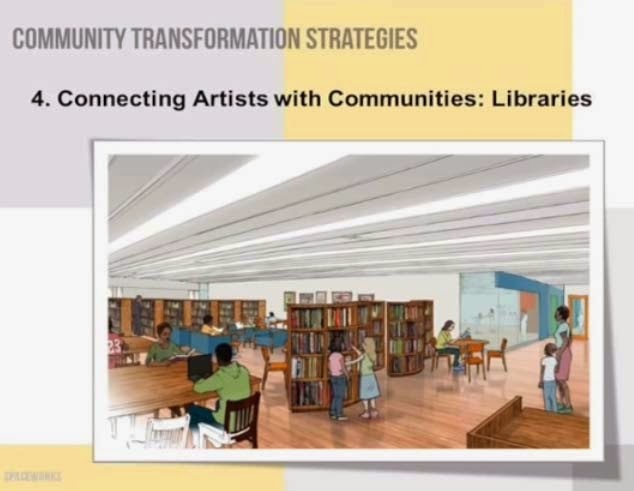 ARTPLACE: Civic leaders are experimenting with new roles for library buildings across the country. Major technological change and the desire for publicly accessible community space have created an opportunity to expand the definition of how a community uses its libraries. What role might Spaceworks initiatives play in libraries? PARKHILL: Libraries remain an incredibly important public resource, but the way they are used has changed dramatically in the last decade or two. In addition to the changes related to the proliferation of electronic media, libraries are increasingly used for a range of community and arts-related activities, from concerts to media centers to yoga classes. The arts uses that Spaceworks will bring to the branches are thus very much in keeping with the overall trajectory of libraries as a whole. 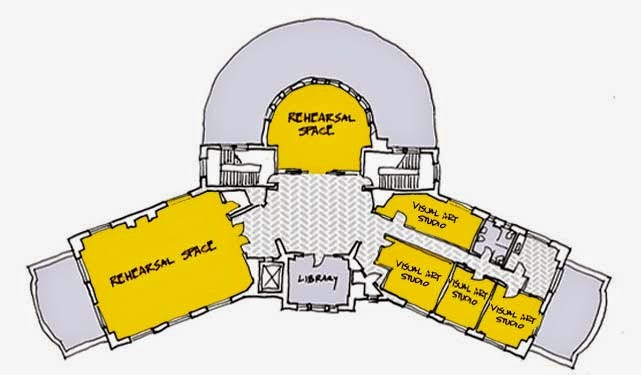 Spaceworks is currently working with both the Brooklyn and New York Public Library systems to build both rehearsal spaces and visual art studios in vacant or underutilized library branches. We see this as an opportunity to attract new users to the libraries while creating spaces that the branches can also utilize. So this is a great way not only to expand library services, but also to invest in the buildings themselves. See: Spaceworks, By ArtPlace America New York, NY, December 7, 2012. Building on the library's existing mission? Or dismantling the libraries as institutions? Spaceworks is collaborating with Brooklyn Public Library to build on the library's existing mission and activities by creating new affordable work spaces for artists. The different uses of the library space, at least not all of them don’t have to be viewed as, per se, inconsistent with the multifaceted mission of libraries. For instance, Spaceworks is proposing performance space to be included in the Williamsburg Library project. The Donnell Library, before its destruction for a real estate deal, had a fabulous auditorium where the community could readily meet for forums and discussion and where jazz concerts were regularly performed. That library with its state of the art media center had a focus on music and performance arts. The first question that must be asked is, if these are true library functions, why is the public library space being put into the hands of a private company created by Bloomberg? The next obvious question to ask is why the city would direct available public funds to this private company rather than to the libraries. Or, in the very least, why wouldn’t public funds for the project come to the library directly from the Department of Cultural Affairs through an appropriate program. Why resort to the interposition of this non-transparent privatization? The next question is whether it is appropriate to hand off and convert this amount of space for uses less related to the traditional core functions libraries are supposed to serve. Also why, if these uses augment library functions, should space be taken over and converted at all rather than adding to existing library spaces? The Williamsburg Library is two floors and Spaceworks will be taking over pretty much the entirety of the upper floor. This may not amount to half the space of the 26,000 square-foot library but how much space should the library be giving up, exiling books? I am a huge fan of libraries but this had the smallest fiction section I've ever seen in my life! They had NOTHING! I'm hoping there are better libraries in Brooklyn but since this one is so close to me it was a huge disappointment. And I really didn't appreciate the woman at the front desk on what seemed like a personal phone call when I was trying to get a library card. Other things to think about: Libraries are generally free. Spaceworks charges user fees intended to be sufficient to make it self-sustaining so the privatization achieves a net subtraction of the resources being made freely available and meant to be shared as part of the public commons. In the case of the Red Hook Library a special separate door will be created for the Spaceworks space. That will mean that Spaceworks can be open when the library is closed. . Or thinking about that conversely, there is less incentive for the library to be open and it goes less noticed when it is closed and its publicly paid for space sits wastefully unused. Even if you value music and the performing arts and think they should be publicly assisted by devoting library system resources, how equitable is it to assist a few lottery winners who can afford fees while libraries are cutting back more broadly on freely available resources as we cut back on library space, like removing the music scores from the shelves of the BPL’s Grand Army Plaza library, or the sale and shrinkage of the NYPL’s Donnell library that did so much to support music and the performing arts? Libraries also have very well-defined policies of equal access developed over a long history with staff familiar with the traditions of administering them. Although the funding that was first announced for Spaceworks has nearly tripled, the list of its first formally announced projects has not grown beyond the first five announced, except for the suddenly disclosed Brooklyn Bridge Furman Street project. Spaceworks identifies Brooklyn Public Library as one of its prime partners for projects, but only the Williamsburg and Red Hook Library projects have thus far been revealed. Spaceworks identifies New York Public Library as another its prime partners but no NYPL projects have yet been revealed. Intriguingly, the Queens Library system is not identified as a partner. Queens is the one system of the city’s three library systems that has not yet been participating in the Bloomberg plans for library sales and shrinkage to create real estate deals. All of this may be about to change: The Queens system is under attack for mismanagement with an effort to change its governance. Attacks on the Queens system involving misconduct are valid in principle but they involve what, in the scheme of things, are relatively small amounts of money compared to losses suffered by the public from mismanagement in the other two systems. Notably, the Queens trustees leading the attack on the current management, while they may be doing the right thing, are Bloomberg appointees. Privatization of Public Housing Space Too! 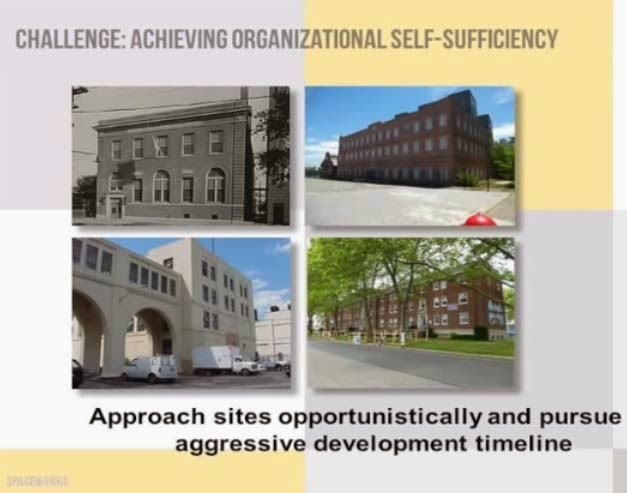 Repeating this slide: What's NYCH, the housing authority doing in the soup of real estate logos above? Ergo, we don’t know what other libraries are in the sights for a privatizing hand-off to Spaceworks. The Bloomberg administration also had in its sights the goal of privatizing and selling off public housing property before leaving office. Its plans go back at least to the reign of former New York City Housing Preservation Commissioner Sean Donovan, who has since gone on to become Secretary of Housing and Urban Development as part of the Obama administration. Spaceworks also identified the New York City Housing Authority that administers the city’s public housing properties as a partner, but has not yet identified what NYCHA properties it might be intending to take privatizing possession of. Accompanying Bloomberg at the ribbon cutting for the first Spaceworks project was First Deputy Mayor Patricia (Patti) E. Harris. Ms. Harris was with Bloomberg as his political strategist before he entered politics and before he amassed absolutely phenomenal wealth as mayor. Ms Harris was involved when, in the summer of 2007, Bloomberg gave his blessing to the sell-off of libraries shortly after which the sale of Donnell and the Central Library Plan were announced. Ms Harris oversaw library matters for the mayor and has always been in a position of oversight at the nexus of things most importantly defining the Bloomberg administration: Political strategy, real estate projects and the use of charities, including Mr. Bloomberg’s own that she used to pull political strings. Also in the relatively select entourage at that ribbon cutting was City Councilman Jimmy Van Bramer. He appeared as Chair of the New York City Council's Cultural Affairs Committee, but, a former librarian, he is also informally thought of by many as `Mr. Libraries,’ probably having attended more events in recent memory than any other local politician as evidence of his love for and dedication to libraries. The City Council’s Library Committee is a subcommittee of the Cultural Affairs Committee and is thus under his oversight. It may seem ironic that a politician that promotes himself as a protector of libraries should have appeared prominently to launch a private corporation that is to be used to privatize and shrink library space. It is not so strange though when you realize that Mr. Van Bramer has been defending the sell-off and shrinkage of libraries, even holding and presiding over a hearing as recently as September 30, 2013 that made an effort to portray the half billion dollar Central Library Plan favorably before it was abandoned as a fiasco about seven months later. It was also on Mr. Van Bramer’s watch that Bloomberg massively defunded the libraries and then let library and city officials cite the resulting lack of funds as reason to sell libraries. Valuing Input From The Public on Spending? 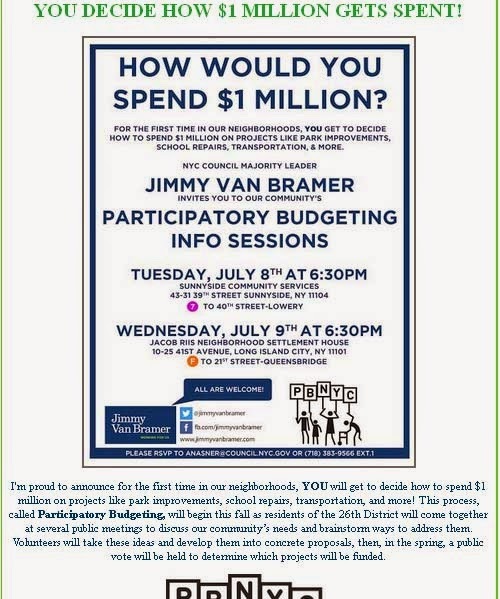 This year Councilman Van Bramer is participating for the first time in an exercise that is catching on amongst council members, something called “Participatory Budgeting,” As a consequence he is telling his constituents that they can decide how to “spend $1 million.” Libraries typically show up high on the list in terms of the public’s votes and its suggestions about how to spend such sums. Given the opportunity, would the public be voting to redirect money for Spaceworks to shrink and privatize libraries? With the greater sums being channeled to Spaceworks largely out of view some might dismiss the “Participatory Budgeting” process involving smaller sums as eyewash and distraction. How much will we even know about how Spaceworks funds are being spent? Spaceworks is required to file a Form 990 with the IRS. The form would normally show the salaries it pays, but against the recommendations of the American Institute of Certified Public Accountants it has used the engagement of a “Professional Employer Organization” (PEO) to avoid reporting compensation to those working for it. All you can therefore discern from the 990 is that during its first year of operation, 07/01/2012 to 06/30/2013, it paid $302,055 for its employee management agreement with the PEO. This is the transparency we get from a private corporation paid for with public money formed by the Bloomberg administration? Perhaps those preparing the Spaceworks IRS tax forms thought this secrecy was a wiser course given how the public has noticed the escalation of salaries for library officials since those officials become involved in selling off libraries. Good Works Building Up Good Will? It is not necessary to question all the activities of Spaceworks or to negate the benefit of everything Spaceworks does to have many serious concerns about its existence and mission. Governors Island is a spectacular asset abandoned by the U.S. Military and the city is benefitting from programs that ramp up a new era of uses for it. 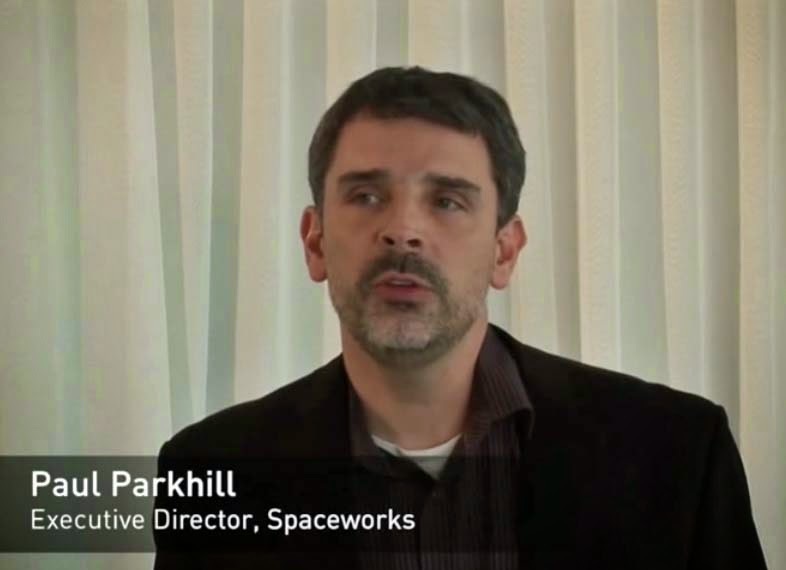 In Parkhill’s PowerPoint presentation we learn that one of Spaceworks current goals is to pursue “flagship projects to raise the profile” of the Spaceworks organization, and presumably get the Spaceworks name a good reputation. Governors Island does that, but still, why isn’t government doing what needs to be done directly (perhaps burnishing its own reputation) rather than having Bloomberg use taxpayer funds for this private corporation? 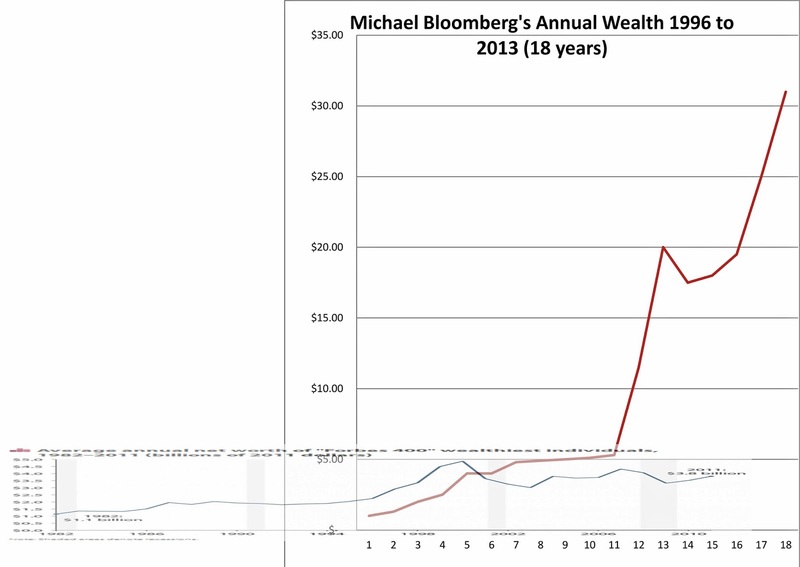 Bloomberg is not altruistic. He has routinely used his charities for political purposes. 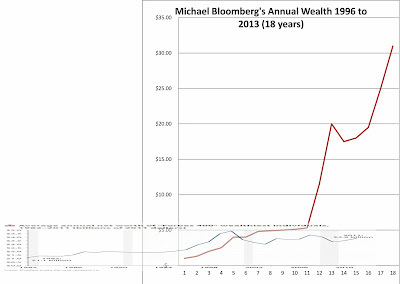 See: Monday, February 2, 2009, The Good News IS the Bad News: Thanks A lot for Mayor Bloomberg's "Charity" (Part I), Sunday, November 1, 2009, Bloomberg vs. Thomson (54% to 29%? ): It's Not What You Think. (For Instance the "P" is Missing and What Might "P" Stand For? ), Saturday, March 19, 2011, Bloomberg Muscles In On Earthquake and Tsunami in Japan With the "Mayors Fund to Advance the City": Charity? We Groan Again!, Monday, October 20, 2008, “Charity?” We Begin to Groan. One practical advantage of Spaceworks being a charity is that, if its purpose is to warehouse property, it can do so at a lower cost because it pays no taxes. In real estate slang there is a term “taxpayer.” It refers to low-rise minimal structures on property that is just sufficient enough to pay the taxes on property awaiting a day when a replacement building will take fuller advantage of the building lot’s development potential. 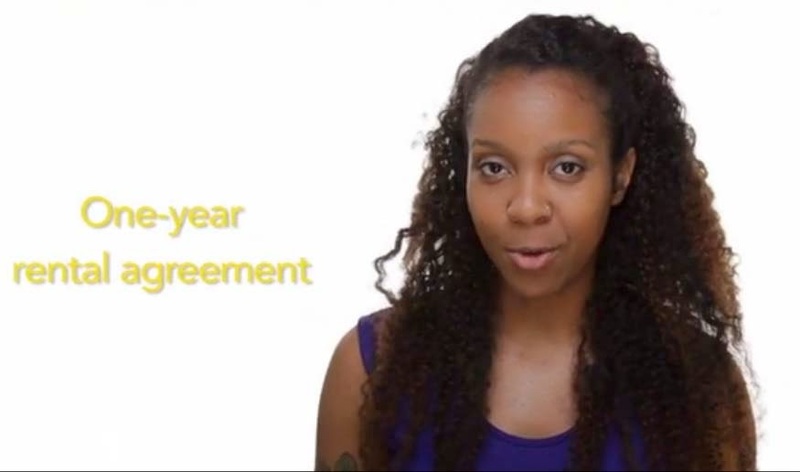 Taxes are a real consideration in holding property as you wait for that day. Spaceworks vs. Library Defenders- A Divide and Conquer Strategy? Libraries also do not pay real property taxes. But it can be hard to move in on a library when you want to sell one, because libraries have their inevitable defenders. 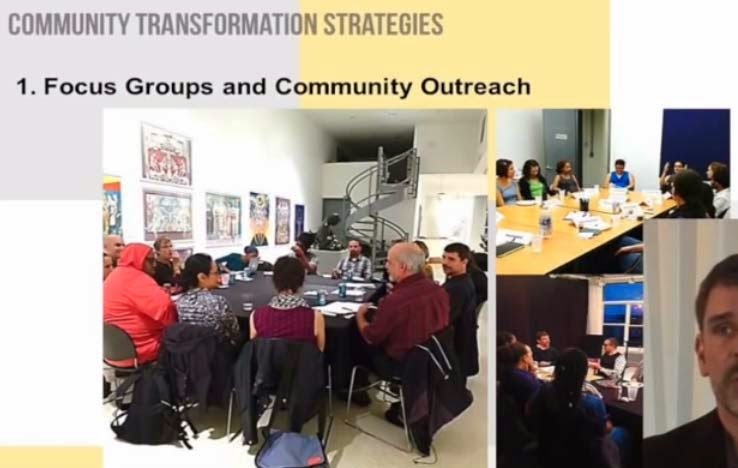 Transforming communities in what way?- Keep reading. In divide and conquer fashion, the Spaceworks strategy makes sidestepping the defenders easier. There will be fewer defenders for libraries that have already been shrunken. A more minimal library is easier to displace to another location, perhaps shrinking it more. The library lovers and the displaced artists will be negotiating, somewhat confusingly, with separate entities for different outcomes and they may not coordinate or unite to be effective. There may be a lack of sympathy for the wealthier artists being displaced, viewed as lucky lottery winners whose luck has simply run out. Some artists might get lured away from the fight with alternative arrangements or benefits, or if they are insufficiently resolute they may retire in the face of adversity. Is all this really planned out in advance? Isn’t it silly to think so? The truth is that we are talking about a long-term unfolding of not exactly known events, what the real estate industry typically deals with, so much that happens will be ad hoc and improvisational in response to what actually happens. This just describes the context in which such improvisations can be expected. Big picture is that right now libraries in New York are a significant institution and important institutions have a way of enduring and persisting over time. The privatizing Spaceworks strategy clears the decks for a different future. Brooklyn Public Library president Linda Johnson was less than forthright about Spaceworks deals in the works. 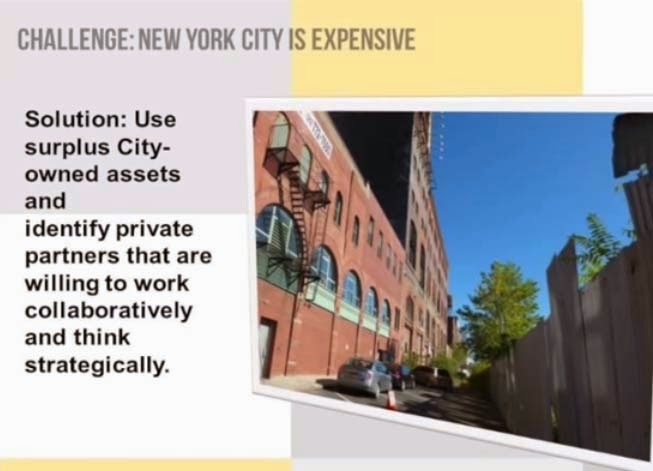 When asked by Public Advocate Tish James at the June 3rd City Council hearing on the city library budget what other library sales or “leveraging” of BPL properties were in the works besides the Brooklyn Heights Library, Johnson did not mention Spaceworks deals. Johnson said vaguely that the BPL was looking at all of its properties for “opportunities” and looking for “partners.” The BPL has previously been frank that their attention is attracted to the most valuable of the public libraries first. In this context Johnson abstrusely hinted, cat and mouse fashion, that the BPL although being warned against it by the public and Ms. James, was not entirely backing away from its earlier goal of selling the Pacific Branch. Ms. Johnson did not tell Public Advocate James about the proposed Red Hook and Williamsburg library privatizations of library space, did not tell her she had found her "partner" for them. Ms. Johnson did not tell Ms James about any other deals with Spaceworks whereby they are considering each other partners. Ms. Johnson did not tell Ms James about plans being looked at for “redevelopment” of the Sunset Park Library (5108 4th Ave. at 51st St.) although the deal being formulated there doesn’t involve Spaceworks. (The Sunset Park and Red Hook libraries are both in City Councilman Carlos Menchaca's district.) Nor did Ms. Johnson fill Ms. James in on what thoughts had been given to selling a list of other Brooklyn libraries for redevelopment like the Clinton Hill Library. Perhaps one reason that Ms. Johnson felt she could avoid answering Ms. James more forthrightly about the Spaceworks deals is that the “long-term” privatizations of real estate in the Spaceworks deals are being fashioned as “licenses.” Remember Mr. Parkhill’s somewhat self congratulatory description of Spaceworks doing “pretty complicated” real estate transactions “without obvious precedents”? It’s likely some lawyer thought up the 20-year licenses to control space as a way to argue that certain public reviews needn’t apply, for instance like ULURP. That could be particularly important for such conveyances in Brooklyn where the libraries, mostly donated by Andrew Carnegie with restrictions, are owned by New York City itself. Last week, Thursday June 26th, one of these 20-year licensing arrangements was brought to Brooklyn’s Community Board 6 Land Use Committee for approval with little fanfare. In fact, one of the Land Use Committee members voting against the proposal said it felt like “an ambush.” The item wasn’t on the committee’s agenda when it was presented. The item was for the Red Hook Library project. A majority of the confused and inadequately informed committee voted to approve the proposal. The next action on the proposal will probably be taken in a non-public meeting of the CB6 Executive Committee scheduled for July 7th. Spaceworks will work closely with the BPL to perform a joint renovation of the Red Hook branch, located at 7 Wolcott Street. In addition to performing long-needed upgrades to the branch as a whole, the renovation work will create two new 1000 square foot rehearsal spaces for theater and dance artists. This is all a rather odd description given that Red Hook library was flooded during Superstorm Sandy (10/29/2012) just reopened Tuesday, April 1st after a substantial amount of work. Maybe the idea is that this renovation paid for by insurance that fully covered everything should be considered an April Fool’s Day joke. Because the library is a one-story library, the entire library was badly hit. The library replaced nearly half of the 2,500 waterlogged books and the 38-year-old building's mechanical and electrical systems, damaged floors, furniture, shelving, and equipment. 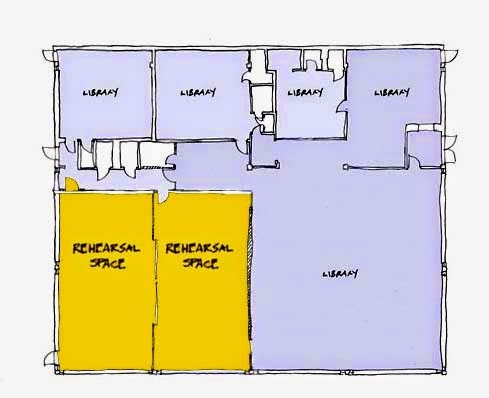 According to this article, bringing Spaceworks into the building for its renovation (giving it two studios aggregating 2000 square feet of the library’s total 7,500 square feet) will require the library to close all over again this year. It would reopen some time in 2015. Neighborhood book lovers are thrilled about the library's comeback. "This library is the life of the community," said Lillie Marshall, president of the tenants association in the west wing of the Red Hook Houses. "It has been truly missed - it serves a great purpose in the community." The branch is slated to close for complete renovation next year, and will come back as a partner with Spaceworks - an organization that helps artists find long-term and permanent studio space. The six promotional stories that ArtsPlace at regular intervals between June 2012 (when Spaceworks was officially formed) and May 16, 2013 were a source to derive a fair number of the insights into its activities provided here. After that last May 16, 2013 publication date ArtsPlace went radio silent about Spaceworks, including its goal of privatizing library space. What accounts for the silence of that past year?. .
. . . Could it have something to do with the fact that on July 12, 2013 candidate Bill de Blasio, running for Mayor, stood on the steps of the 42nd Street Library with Citizens Defending Libraries and other library defenders calling for a halt to the sale and shrinkage of libraries?
. . . Could it have anything to do with the fact that candidate de Blasio thereafter won and became Mayor de Blasio.? Very probably. But absent the stories that were previously being written about it describing what it might be up to next, Spaceworks is still out there and it doesn’t appear to have abandoned its agenda. That’s why people are still fighting to prevent the sale and shrinkage of libraries and the elimination of books and librarians. That’s why Citizens Defending Libraries of which I am a co-founder has a new petition up to make sure that Mayor de Blasio’s resolve stays firm. You are invited to sign it: Mayor de Blasio: Rescue Our Libraries from Developer Destruction. Our library trustees ought to be on guard to protect our libraries as institutions. Shouldn’t they be fending off dismantling of the institution? One thing the Mayor, the Comptroller, the Speaker of the City Council and the Borough Presidents can all do, perhaps prompted and encouraged by those signing the petition, is appoint representatives to the library boards who, leveling a critical and discerning eye, will shun no-bid contracts with the likes of Spaceworks and will send packing this Bloomberg-created private firm that is spending public money to privatize public space. Would that be a woeful outcome for those sweepstakes-winning artists that might have been ministered to if Spaceworks pursued its agenda? Maybe not so much. Not if the true Spaceworks agenda, despite its promises of fostering stability and predictability for artists, was in the end delivering the same Sisyphean frustrations for artists, allowing them, just as before, but in a more controlled and shepherded fashion, to be placeholders decorating and enlivening a neighborhood for a time before that inevitable day of their eviction to clear the way for those higher up on the economic ladder.